When I was learning Kodály at university, I became fluent in Solfege and ta’s and ti-ti’s. 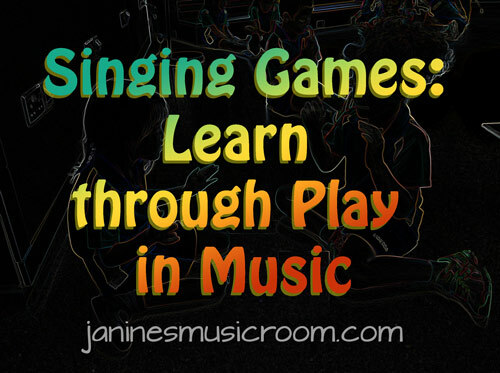 I analyzed folk songs and canons and worked with the proper progression of rhythmic and melodic learning. But what I’ve taken away from this course, and what I feel was new learning for me, was the central role of singing games . Through well-planned, purposeful use of simple singing games, we can work through so much learning. Plus, playing clapping games like a schoolgirl is energizing and FUN. So today’s post is hardly profound or groundbreaking, but my takeaway is this: I am going to make a point of playing singing games. Every day. With every grade level. Whatever the game is, I can always add layers; I can always make it an opportunity for learning. I’m starting with “Little Sally Walker“ and “When Billy Was One” (a new one for me). What are your go-to singing games?